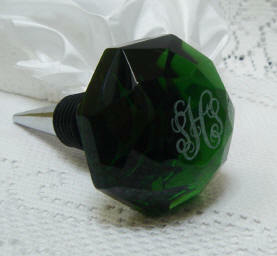 Engraved Monogrammed Crystal Wine toppers in six colors! 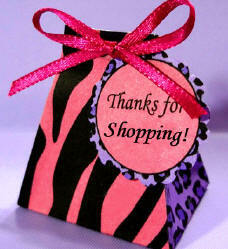 Home > PERSONALIZED Gifts > Engraved Monogrammed Crystal Wine toppers in six colors! 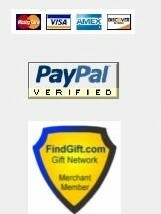 Join our mailing list (below) and as our Thank You, you will receive a 5% off coupon code, to apply to your purchase! This stopper is the dark green. Click image below to view larger. Our crystal bottle wine toppers come in a variety of colors and are both elegant and functional. Personalize the bottle toppers with engraved initials and these stoppers are a sure hit! Give a rainbow of colors party! Great wine toppers too. Stainless steel shaft and rubber gaskets great for sealing, preserving, and protecting your wine against harmful contaminants. 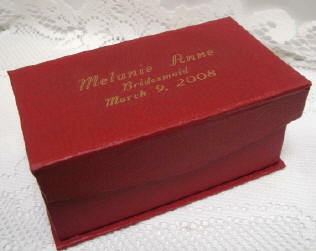 Delivered in an elegant satin lined gift box. custom monogramming & engraved gifts.